Find out which all car brands are offering discounts on car purchase in India in the month of February 2019. If you’re interested in purchasing a new four-wheeler, February could be the best month for you to buy your favourite new car. And the very reason is that a majority of automobile manufacturers are currently offering discounts on multiple car models to clear their stock of previous year’s manufactured cars. Just to understand, if a car is purchased in the month of December and if an individual wants to resale it the very next month (i.e. January of next year), his car would be considered an old car and will be treated as a year old one. This is one of the biggest reasons why the sale of cars decline post festive season in India, especially, in the month of December. And this in turn, leaves unsold stock of cars (manufactured in the previous year) at the dealerships and manufacturer warehouses. Therefore, to clear the stock of previous year’s models, companies usually sell their old models at a considerable discount. And this happens usually between December to February. During this time, apart from the discounts, manufacturers also sometimes offer various incentives like exchange offers, free accessories, maintenance benefits, etc. And to grab these deals, car buyers should be well aware of such discounts beforehand. If you’re in the list of those smart buyers who are hunting for mouthwatering deals on cars, keep reading! In February 2019, many automotive manufacturers are offering discount on their range of cars. 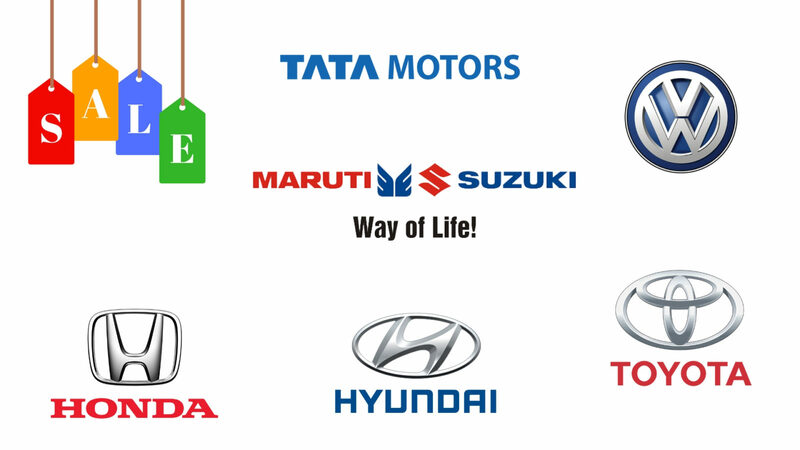 Let’s find out which are those automobile giants who are offering the most attractive discounts. Maruti Suzuki is offering a discount of around Rs. 22,000 to Rs. 80,000 on its vehicles, with S-Cross getting the maximum discount. Maruti is also giving discount on its various four-wheeler models like Maruti Celerio, Maruti CelerioX, Maruti Dzire, Maruti Alto K10, Maruti Vitara Brezza, Maruti Swift, Maruti Alto 800, Maruti Eeco, etc. Another brand which is getting a lot of customers’ attention is Hyundai. Hyundai is one such brand which is giving maximum discount on its cars, with Hyundai Elantra and Hyundai Tucson both getting a discount of around Rs. 1.3 lakhs. Apart from these two cars, Hyundai has also reduced the price of its various other models like Hyundai Grand i10, Hyundai Xcent, Hyundai Elite i20, Hyundai i20 Active, and Hyundai Verna. Each one of these cars is getting a reduction between Rs. 50,000 to Rs. 1 lakh. Tata is considered as one of the most renowned names in the automobile sector. Customers are always attracted to each and every vehicle this car manufacturer produces. And to remain in the competition, Tata is also offering discounts on its various car models like Tata Tiago, Tata Tigor, Tata Nexon and Tata Hexa. Discount on these Tata cars range from Rs. 50,000 to Rs. 1 lakh. Just like every other brand mentioned above, Honda is also offering huge discounts on its various popular car models. Honda’s Brio, Jazz, Amaze, WR-V, City, and BR-V are some of the cars offered at discounted price. Honda Brio is been offered at a discount of Rs. 19,000 approx., while the prices Honda BR-V are slashed by Rs. 1 lakh. Volkswagen is also one of the brands which is getting customers’ attention because of its discounts. The brand is offering a discount of Rs. 50,000 approx. on the Polo, while the discount offered on the Ameo is around Rs. 65,000. Apart from the Polo and the Ameo, Volkswagen is also offering Rs. 1 lakh discount on its Vento sedan. So if you’re planning to purchase a brand new four-wheeler, you shouldn’t wait for long as most of these offers won’t last after the end of February.